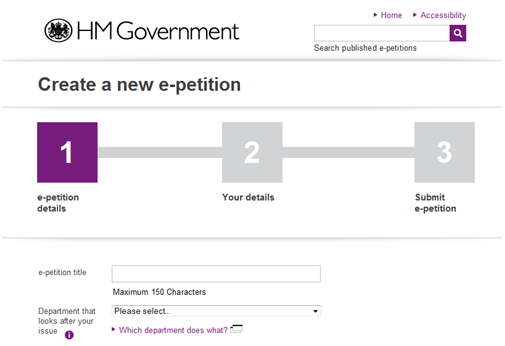 Doesn’t anyone see a worrying theme in the attitudes being displayed in the e-petitions? Some examples being: returning to the death penalty and leaving the Court of Human Rights. Given the problems that society has in the UK – its excessive use of alcohol, teenage pregnancies etc, doesn’t it seem more suitable to be improving the way our society operates instead of reverting to a time gone by which, most of Europe left behind decades ago? Or do we wish to be seen as a society which lives in the past and can not move forward to a more modern society? If you give everyone a voice, you are at the mercy of the apathetic uninformed majority. Democracy. Suddenly it doesn’t look so great, does it? When it is the Councils causing the problem setting people up as vexatious litigants telling them to complain was only way of raising issues .Why are you sending back to those that ignore ,neglect & harrass. How come ones had rejected here taken to USA where not so dicriminatory and unreasonable& doing well.Who is in charge in this deregulated country the unreasonable admin or the elected rep ? Have spent months trying to address this including another 2 hrs this morning having originally tried Fix My Transport who sent it to the Tube ??!! !You will bet this will not get signed so have to suffer yet again.There is a law against this why are councils & Government & PM getting away with breaking it? Deregulation as can be seen from PM Petition site that was a waste of time as never directed. It appears nobody in administration at Islington Council is checking that the money used to fund this is giving fair access as it appears that a call centre with no discretion is telling Camden Councillors & MPs including J Corbyn & Frank Dobson and those on on Exec & Disability how to discriminate and they are allowing this to happen having aligned Social Services with the Housing department.